Introduction: The management of neurologic emergencies is an important component of critical care fellowship training. Additional training in neurocritical care has been demonstrated to improve clinical outcomes, though exposure to these emergencies during training can be limited. Methods: Three simulation cases are presented as part of a comprehensive neurologic emergencies curriculum for critical care trainees. The cases represent neurologic catastrophes encountered in the intensive care unit consisting of symptomatic hyponatremia, severe alcohol withdrawal syndrome, and brain herniation syndrome. The case descriptions are complete with learning objectives, critical actions checklists, and debriefing material for facilitators, as well as all necessary personnel briefs and required equipment. Results: The scenarios were completed over the course of the 2016-2017 academic year by first-year critical care fellows. Following curriculum implementation, there was an improvement in self-perceived confidence of fellows in neurologic emergency management skills. Discussion: The cases were felt to be realistic and beneficial and led to perceived improvement in management of neurologic emergencies and leadership during clinical crises. Manage neurologic emergency scenarios in a simulation setting. Recognize impending herniation syndrome, including acute loss of consciousness, hypertension, bradycardia, and apnea. Provide temporizing treatments for herniation syndrome, including head of bed elevation, avoiding stimulation and hypermetabolic states, and administering hyperosmolar therapy. Prioritize treatments for symptomatic hyponatremia, including sodium bicarbonate and hypertonic saline, while targeting goal sodium correction rate of no more than 4-6 mEq/L in a 24-hour period. Formulate a management plan for refractory seizures in alcohol withdrawal syndrome, including building a differential diagnosis of metabolic etiologies and treatment with benzodiazepines, phenobarbital, or propofol. Lead a debrief session with a multidisciplinary team following a clinical crisis while navigating interpersonal conflict, exhibiting active listening, integrating input from multiple team members, and building a shared mental model. Critical care is delivered in increasingly subspecialized environments, each with a supportive evidence base and best practices. Neurocritical care is one example of specialty critical care, with care that includes a distinct focus on neuroprotection that can lead to better outcomes for patients with critical neurologic disorders.1,2 Training for all critical care fellows should include exposure to the management of these life-threatening neurologic derangements. Knowledge of the pathophysiology of the neurologic system in critical illness is in fact recognized as a core entrustable professional activity during fellowship.3 Neurologic syndromes, however, can be more difficult to diagnose and manage appropriately for nonneurologists, and this can lead to worse clinical outcomes.4 Thus, to better recognize, triage, and manage neurologic catastrophes, additional training and practice are imperative for critical care trainees. We present a curriculum consisting of three simulation scenarios that are specific to the intensive care unit (ICU) environment: symptomatic hyponatremia, severe alcohol withdrawal, and herniation syndrome. This curriculum fulfills an educational need by including critical care management of neurologic syndromes. In addition, the interdisciplinary nature of care in the ICU is emphasized, allowing for practice of leadership skills during crisis scenarios. Our simulation curriculum utilizes SimMan (Laerdal Medical, Stavanger, Norway) along with standard ICU equipment. The simulations incorporate multiple care team members, including nurses, respiratory therapists, and residents, to replicate the ICU as closely as possible. The curriculum included three cases detailed in the appendices: hyponatremia simulation scenario (Appendix A), personnel and equipment (Appendix B), and critical actions checklist (Appendix C); severe alcohol withdrawal simulation scenario (Appendix D), personnel and equipment (Appendix E), and critical actions checklist (Appendix F); and brain herniation simulation scenario (Appendix G), personnel and equipment (Appendix H), and critical actions checklist (Appendix I). Each case included learning objectives, critical actions, role descriptions for confederates and other ICU personnel, and patient information including physical examination and relevant diagnostic studies, as well as debriefing information reviewing ideal medical management and common pitfalls for each scenario. We designed the scenarios assuming baseline competency in airway and ventilator management. The study was determined to have exempt status by the University of Washington Institutional Review Board. We identified first-year critical care fellows as the target learners. We designed the scenarios for two fellows to participate: the lead fellow and the support fellow. The lead fellow was tasked with primary management of the case, and the support fellow was asked to provide procedural or other support when directed by the lead fellow. We also included confederate staff to improve the fidelity of the environment, with participants including nurses, respiratory therapists, and residents. We developed the scenarios for use in a simulated ICU room including a manikin with intubation and mechanical ventilation capabilities. In one case, the patient was portrayed by a confederate. We displayed the patient’s vital signs on a monitor visible to participants so that dynamic changes could be readily seen. Individual simulations had specific equipment needs, though each simulation included items commonly encountered in the ICU. At our institution, we implemented the three scenarios in a series of four half-day simulation sessions over the course of 1 academic year. Each half-day session featured one of the included neurologic emergency scenarios as well as two to three other ICU emergency scenarios. We collected survey information following session 1 at the beginning of the academic year and session 4 at the end of the academic year. We introduced the simulation environment and equipment prior to the scenarios with a brief orientation. Two critical care fellows (one lead fellow and one procedure/support fellow) participated in each scenario. The simulation environment was designed to replicate an ICU patient care room with standard equipment and multiple confederates representing additional ICU staff. We used SimMan to simulate the patient, aside from one scenario where the patient was portrayed by a confederate. The fellows not directly participating in a particular scenario observed the simulation in real time along with faculty members from another room via live video feed. At the end of the scenario, the lead fellow debriefed with the simulated ICU team. After the in-room debriefing, the lead and support fellows joined the observing fellows and faculty for a facilitated discussion of the medical management and leadership aspects of the case. We evaluated fellows during the scenarios using a critical actions checklist. The checklist components were integrated into each act of the simulation scenarios to prompt the facilitator. The embedded critical actions did not necessarily occur within the act but were designed to signal the facilitator to the approximate time points for the important interventions. The lead fellow was asked to provide a self-assessment and also received peer feedback. We developed debriefing materials for faculty-led review of the medical and decision-making aspects of the cases, including ideal practices and common pitfalls. The checklist and debriefing material facilitated delivery of formative feedback to learners. We distributed anonymous surveys at the end of the sessions to evaluate participants’ subjective experiences. The survey questions specific to neurologic emergency cases are included in Appendix J. The lead fellow performed a clinical debrief with the entire simulated ICU team after each scenario; all participants were asked to stay in character. After completing the in-scenario debriefing, the simulated ICU team moved out of the scenario environment to a nearby room where the faculty led a debrief of the medical management and leadership features of the case. We preferred to allow the lead fellow in the scenario to voice his/her opinion first as to the successes and challenges encountered in the case. Faculty also invited discussion from the other fellows who had observed the scenario from outside the simulation environment to highlight other salient features of the case that they had noted. During the 2016-2017 academic year, first-year pulmonary and critical care fellows at the University of Washington completed the neurologic emergencies scenarios as part of an ICU emergencies simulation curriculum. A total of 11 fellows participated during four half-day sessions throughout the academic year. 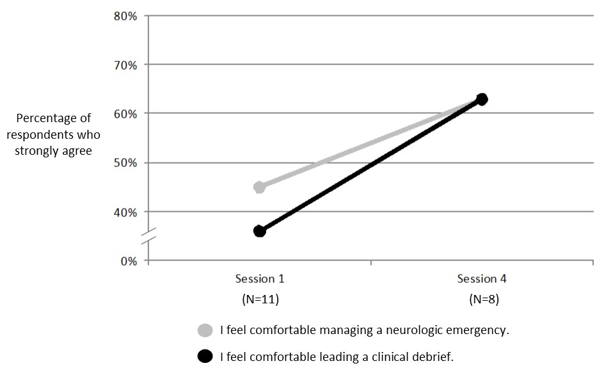 Comparing session 1 at the beginning of the academic year and session 4 at the end, self-perceived comfort in managing patients with neurologic emergencies increased from 45% in strong agreement to 63% (see the Figure). Another focus of the curriculum was improving leadership during a crisis. Most fellows felt more comfortable leading a clinical debrief following a crisis event, with 36% in strong agreement after session 1 and 63% in strong agreement after session 4.
and session 4 was completed at the end of the academic year. Implementation of a simulation-enhanced curriculum for critical care fellows focusing on neurologic emergencies is feasible and, in this case, was well received. Neurologic emergencies may be infrequently encountered during fellowship training, though proficiency with their management is a designated entrustable professional activity. Simulation is well suited as an educational method for training in neurologic emergencies, though there are no available published curricula that focus on relevant critical care practices. This simulation-enhanced curriculum for neurologic emergencies for first-year critical care fellows includes three high-stakes cases: symptomatic hyponatremia, severe alcohol withdrawal, and brain herniation syndrome. The scenarios were noted to be realistic and beneficial, and they achieved the goal of improving comfort in managing neurologic emergencies. The curriculum also highlighted the traits of effective leadership during crises, including team management under stress and clinical debriefing with a multidisciplinary team. There were several challenges in implementing the scenarios. The fellows were originally assigned to the lead fellow role for each scenario. Based on learner feedback, the process was modified to ask fellows to volunteer for the role prior to each scenario, while ensuring all participants rotated through the primary leadership role. Another challenge was simulating seizure activity, which was required in two of the scenarios. The manikin representing the patient had a seizure function in which the extremities appeared to vibrate, though this was not necessarily recognized as seizure activity by the fellows. As a remedy, one of the confederates in the room, typically the resident, would draw attention to the movements when they began and ask the lead fellow if the patient could be seizing. As another general principle, fellows were frequently uncertain of doses of particular medications, such as nonbenzodiazepine antiepileptics and protocols for hypertonic saline administration. In this case, the intern would leave the room as if consulting with a pharmacist and would return a few minutes later with recommendations. In addition, there was a tendency for simulation participants to break character during the immediate postevent clinical debriefing. If this occurred, the in-room observer was tasked with prompting participants to remain in character and to practice using language they might use in real-life scenarios. There are several important limitations to the curriculum. The learner cohort was small by design, with the content specifically targeting first-year critical care fellows. The relatively small size, however, limited the scope of curricular evaluation. The curriculum could be easily expanded to other learner groups, such as neurology or emergency medicine residents, given the frequency with which they may also encounter neurologic emergencies. Another limitation is the subjective nature of our assessment: The primary outcome was self-reported comfort with management of neurologic emergencies. Comfort is confounded by a maturation effect, however, as advancement through fellowship could be responsible for the observed increase across the educational sessions. Direct assessment of clinical skills was not performed in a rigorous fashion nor were metrics captured demonstrating improvement in knowledge or bedside skills with real patients. The included critical actions checklists could be used as a scoring rubric to evaluate competency more meticulously, though in this implementation, the primary goal was formative development of the fellows delivered through faculty and peer evaluation. Steinbach TC, Adamson R, Carlbom D, Johnson NJ, Kritek PA, Çoruh B. Leadership education for critical care fellows using simulation. Presented at: American Thoracic Society (ATS) International Conference; May 24, 2017; Washington, DC. The University of Washington Institutional Review Board approved this study. Ansari M, Swor D, Moreno G, et al. Simulation-based medical education in acute neurologic emergencies [abstract]. Neurology. 2017;88(16)(suppl):P1.059. Loomis C, Robeson K, DiCapua D, et al. Simulation of neurological emergencies for milestones-based learning and assessment [abstract]. Neurology. 2016;86(16)(suppl):P2.357. Tariq N, Irfan M, Willging J, et al. Simulation boot camp for neurology residents: a unique experience from a training perspective [abstract]. Neurology. 2014;82(10)(suppl):P1.307. © 2019 Keller et al.